« Social Media – is it really mainstream in B2B Marketing? Whether you’re on the Facebook home page, reading comments on a friends’ Walls, or playing your favorite Facebook game, you have probably noticed at least one advertisement running on the right hand side on the page. These ads are available to anyone with an advertising budget, from $1 to $1 billion. And many large advertisers, such as Pepsi, Proctor & Gamble, and Wal-Mart are running ads on Facebook, but so are many small businesses. These ads like any other include a headline, an image and body copy. But increasingly, Facebook Ads are also including ways to engage in a social action, such as “Liking a Page,” or “RSVPing to an Event”. Ads that include a social action are referred to as “Social Ads” or “Engagement Ads.” And according to a study by Neilsen on Facebook Ads there is much better awareness, ad recall and best of all purchase intent when your friend “likes” or mentions a company to you via Facebook. 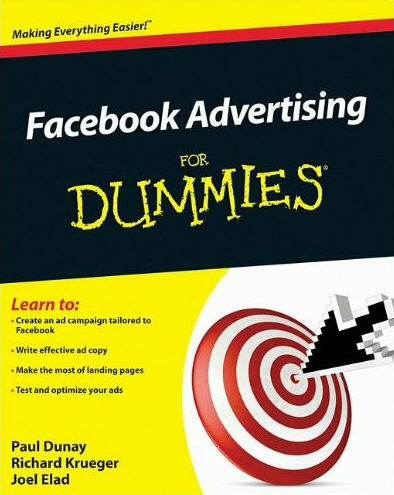 So as a natural follow up act to last years Facebook Marketing for Dummies (Wiley 2009) which is now going on its 2nd Edition (after 4 printings of the book), I have once again teamed up with college buddy and CEO of AboutFaceDigital, Rich Krueger and writer Joel Elad (of LinkedIn for Dummies fame and other tech books) to bring you Facebook Advertising for Dummies which will be published by Wiley this fall and is available for preorder now on Amazon. Our hypothesis is that Facebook Ads will become a strong component in every marketers toolkit much the same way as Google AdWords is today. Although fundamentally different in nature – the targeting and efficiency of Facebook Ads will make it irresistible to marketers over the long term plus the increase in brand awareness and purchase intent doesn’t hurt either. We hope you agree! Looking forward to reading this, Paul. I’ve done some experimenting with Facebook ads and seen success. Hope your book will inspire me to take this to the next level! Thanks Bryan – this is my 3rd book and I really feel like this one is going to be really good! I believe there is immense potential for highly specified marketing with use of the Facebook Ad Service. When playing with the Ad Creator I was really impressed with the way it updates in real-time what sort of advertising audience it’s going to specifically capture. I look forward to reading your book and further understanding what it is capable of.